USB Type-C to C power delivery cable for USB-C devices requiring a power delivery method through USB Type C ports including new technology laptops, game consoles, cell phones. Support 3 Amp max. current to power USB-C devices. USB 3.1 Type-C to Type-C Power Delivery Cable is a USB cable that supports new technology USB ports. Use in newer laptops, Game Consoles, Cell Phones and other Type-C power delivery (PD) ports. 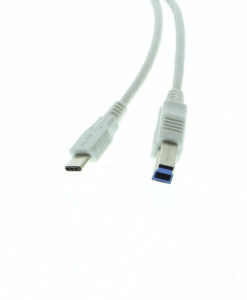 This USB PD cable once connected to a power source can support power profiles up to 60W. The cable supports both USB 3.1 Gen1 (Up to 5Gbps data transfer and PD for normal charging) and USB 3.1 Gen2 (Up to 10Gbps data transfer with power delivery up to 60W profiles) USB standards.